Lighting Requirements. The original D-IMager, Model 3104, serves in lighting conditions up to 20,000 lux. So does the Model 3105, though it has a higher sensitivity than than 3104. Model 3106 addresses high illumination applications—up to approximately 100,000 lux. To date, the 3106 is the only commercially available IR ToF sensor that can be used with such high illumination levels. Pixel Format. All D-IMagers have a nominal pixel format of 160 x120. They have a minimum measurement range of 1.2 meters. Maximum measurement range is 9 meters for Models 3104 and 3106. Model 3105 has a maximum range of 5 meters. Frame Rate. All three models offer frame rates of 15, 20, 25 and 30 fps. Field of View. The further the target is away from the camera the greater field of view (FoV) angle and the lower the resolution. In most applications, FoV above 60 degrees can easily be balanced with the resolution needed for gesture or movement tracking applications. VR-Zone quotes Japanese language IT Media saying that Toshiba unveiled on March 28, 2013 a new 4.7mm-thin 1/3.07-inch camera module aimed to smartphones and tablet computers. It is designated as the TCM9930MD, and Toshiba claims that it is currently the world's thinnest 13MP camera module. 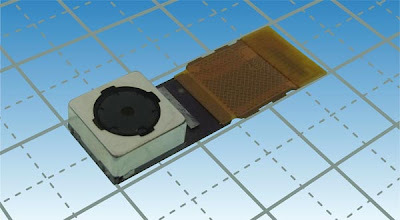 Samples of the camera module will be available at around May 2013. Mass production of the modules is projected to start in December 2013. Tech-on adds that the TCM9930MD lens consists of four plastic elements, and a dedicated signal processing circuit is used to compensate for the lens distortion and restore MTF in the peripheral area of an image. Also, Toshiba used a flip chip instead of a wire bonding to further reduce the thickness of the module. Update: PR Newsire: Achieving today's high-resolution requires a larger optical size for corresponding lenses which results in a thicker camera module and a bulkier mobile device. The conventional method for lowering the camera module height is to modify the optical lens design which becomes problematic due to resolution drop around the corners of the image area. The TCM9930MD, however, resolves this drop in resolution with the use of the image pre-processing LSI (companion) chip that provides distortion correction and performs image resolution reconstruction (Resolution reconstruction is a super-reconstruction technology developed by Toshiba Corp. R&D center). Additionally, the TCM9930MD achieves its low profile by using a flip-chip structure for the image sensor. 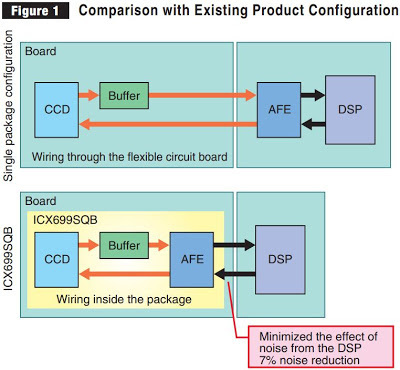 Toshiba opted to use flip-chip packaging because it allows for a large number of interconnects, with shorter distances than wire, which greatly reduces assembling area and package height. Business Wire: Toshiba announced 1/7.3-inch 1080p60 sensor based on 1.12um BSI pixel and integrating a color noise reduction (CNR) circuit. Samples will be available at the end of April with mass production scheduled to start in September 2013. The new T4K71 sensor is said to achieve a SNR equal to Toshiba's existing 1.4um pixel product. It enables chip and camera module miniaturization and will contribute to achieving thinner smartphones and tablets. The T4K71 was mentioned in the former Toshiba PR, so this one mostly re-iterates and expands on the previous info. 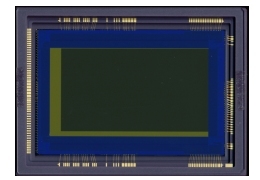 Update: PR Newswire: Sample pricing for the T4K71 CMOS image sensor is $8.00. Samples will be available by the end of April 2013, with mass production scheduled to begin in September 2013. Laser Focus published Kasalis‘ article on its camera module alignment process and technology. DOC will accelerate the use of partner manufacturers for the production of camera modules and will focus its own manufacturing on the lens barrel assembly, which is a higher-margin component for which DOC has unique proprietary technology. This approach will cut DOC’s expected capital spending in 2013 by roughly half – to a range of between $5 million and $7 million, as compared to the Company’s previous estimate of $10 million to $15 million. DOC is consolidating its manufacturing capabilities into its Taiwan facility and expects to cease all operations at its leased facility in Zhuhai, China. DOC will transfer a portion of the manufacturing equipment located there to Taiwan. DOC will terminate its current lens manufacturing program and instead will focus on designing lenses that its partners can produce for use in DOC’s proprietary assembly technology. The Company expects to take a total charge of between $17 million and $23 million, which includes restructuring, impairment of assets and other related exit costs, with the majority taken in the first quarter of 2013 and the remainder in the second quarter of 2013. The Company has determined that it is no longer necessary for DOC to be a vertically integrated camera module supplier. DOC will instead focus its strategy on the differentiated MEMS-related technologies, where it has proprietary assembly technology and expertise, and will partner with third-party manufacturers to produce other components of the full camera module. 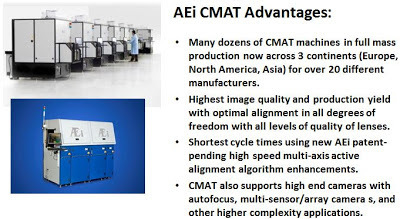 DOC will continue to productize the mems|cam technology throughout the rest of the year, and expects to ship small production volumes of its technology in 2013. The refocused DOC strategy and restructuring resulted from a business strategy review directed by a committee of independent directors, led by Richard S. Hill, former chairman and CEO of Novellus Systems. The Committee worked with management to evaluate the Company’s overall business opportunity, strategy and operating model. The Committee and the Board of Directors will continue to monitor the DOC business closely to ensure that its strategy and business model are appropriate for the market opportunity. Thanks to SF for the link! Other new Towerjazz offerings include pixels with improved sensitivity and resolution in NIR which for automotive driver assistance sensors and 3D gesture control applications. In addition, the foundry now offers small global shutter pixels on 0.11um CIS hybrid process that includes a thin optical stack solution for improved angular response. Tech-on: Fujitsu Labs pesented an interesting application to measure pulse by using video of a human face in real time. The new technology detects pulse based on color elements of video by exploiting the fact that hemoglobin in blood absorbs green light and detecting color change on a facial surface caused by blood flow. An influence of facial and body movements (such as talking on the phone) is automatically removed. "At the fastest rate, it can measure pulse in five seconds," said Yoshinori Yaginuma, director, Human Solutions Laboratory, Human Centric Computing Laboratories, Fujitsu Laboratories. "The maximum margin of error is about ±3 heart beats per minute." "The required resolution is VGA or so," he said. "Twenty frames per second are enough. So, a camera of a personal computer, tablet computer or smartphone is sufficient." The company is considering using the technology for simple health checkup at home, monitoring elderly people, automatic health problem detection in offices and detection of sick people and suspicious individuals in airports or at gates at event sites. Cnet: Lytro named Jason Rosenthal as CEO, effective April 15. Rosenthal previously was an executive at Silver Lake Partners and CEO of social-networking start-up Ning. He also worked at AOL, Hewlett-Packard, Netscape, and OpsWare. He'll replace interim CEO Charles Chi, who took over when founder Ren Ng stepped aside as CEO in June 2012. Ng will remain executive chairman, the company said. PRNewswire: Toshiba announces its newest device for the security/surveillance and automotive markets, a full HD (1080p) CMOS image sensor with 100dB DR, frame rate of 60fps, pixel size of 2.7um, and color noise reduction in low-light conditions (CNR). The TCM5117PL 1/3-inch sensor is aimed to security/surveillance cameras and automotive systems. Toshiba's single-frame, alternate-row, dual-exposure HDR implementation in the TCM5117PL is better suited for capturing fast-moving objects compared to conventional multi-frame systems. With frame rates at 30fps for conventional multi-frame systems, the single-frame approach, at 60fps, promotes faster, less blurry images in high-contrast light conditions. The TCM5117PL is designed for long-term use, operating 24 hours a day. The TCM5117PL has a 3.3+/-0.3V single-power supply and comes in a 10.5 ×10.0 mmP-FLGA80 package. The device supports RAW10/RAW12 data formats. Samples of the TCM5117PL sensor are available in Q2/2013. 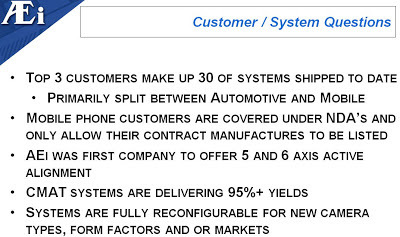 Mass production is scheduled for Q3/2013. Sample pricing is set at $35. Digitimes reports that Pixart is expected to start small volume shipments of its gesture recognition chips for notebook and other mobile applications in the second quarter of 2013, according to the newspaper's sources. Melexis releases a product family designed for optical proximity and gesture detection systems in automotive environments. The MLX75030 and MLX75031 feature two simultaneously operating light measurement channels which can detect the active optical reflection from a target. The proprietary integrated, ambient light suppression makes these channels highly tolerant to background light interference. Two additional channels are available to measure ambient light to ensure operation up to 15Klux (MLX75030) or 20Klux (MLX75030). On system level, the MLX75030 and MLX75031 should be complemented by one or two LEDs and photodiodes, of any type, for active light detection. Melexis shows a video illustration of how it works. "CMOS image sensors were [one of the] fastest growing product category in 2012 with sales rising 22% to a new record-high $7.1 billion, blowing past the previous peak of $5.8 billion set in 2011. Since the 2009 downturn year, CMOS image sensor sales have climbed 85% due to the strong growth of embedded cameras used in smartphones and portable computers (including tablets) and the expansion of digital imaging into more systems applications. 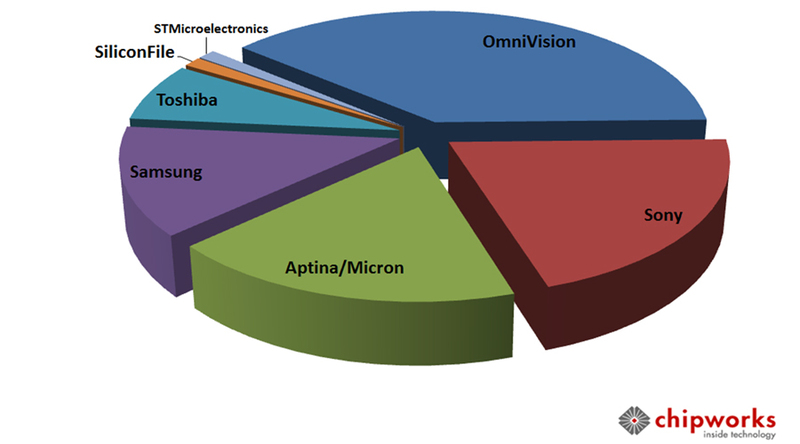 CMOS designs are now grabbing large chunks of marketshare from CCD image sensors, which are forecast to see revenues decline by a CAGR of 2.4% between 2012 and 2017. Sales of CMOS imaging devices are projected to grow by a CAGR of about 12.0% in the forecast period and account for 85% of the total image sensor market versus 15% for CCDs in 2017. This compares to a 60/40 split in 2009." IEEE Spectrum publishes an article on Ion Torrent genome sequencing approach and the company Founder and CEO Jonathan Rothberg. Ion Torrent's pH sensor is quite similar in technology to image sensors. Written in a popular manner, the article talks about the market, compares Ion Torrent's approach with competitors and more. "Last March, a study from the insurance company UnitedHealth Group predicted that spending on genetic tests will skyrocket from about $5 billion in 2010 to between $15 billion and $25 billion in 2021." Another interesting observation is that "All of OmniVision’s devices are back illuminated, while all of Aptina’s and Toshiba’s are front illuminated. Sony and Samsung had a mix of front and back illuminated devices winning primary camera sockets (although the majority of sensors from both companies are back illuminated)." There is a lot of other interesting data in the Chipworks article, well worth reading. Thanks to PD for the link! MPNNow, Rochester Business Journal: Dynamax Imaging LLC will be relocating to the College of Nanoscale Science and Engineering’s (CNSE) Smart System Technology and Commercialization Center of Excellence (STC) in Canandaigua, NY. This will create and/or retain more than 100 high-tech jobs in Canandaigua, according to the governor. The move was needed because the company had outgrown its previous location in Homer, Cortland County, the governor said. Dynamax will install more than $3M in equipment — plus establish the 100 jobs — at the STC over a three- to five-year time span. The majority of the company’s engineers, scientists and researchers from other U.S. locations will move to the STC this year, and it will hire 30 to 50 cleanroom operator and technician positions to support the company’s research, prototyping and pilot production activities. "We look forward to advancing our innovative image sensor technologies, developing new products and establishing new partnerships, all of which will enable the company to grow and flourish, and maintain the reputation of New York as the ‘imaging capital of the world,’" said Jim Tan, president and CEO of Dynamax, in a statement. 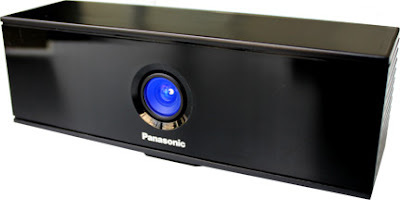 PR.com: Newly formed Town Line Technologies has been created to design full custom image sensors, as well as providing consulting, layout and design services related to image sensing applications. Town Line Technologies will engage in contract/development work, leveraging experience of over 25 years in the image sensor business. 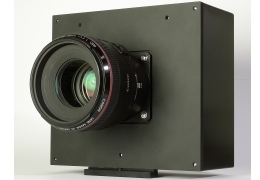 Town Line Technologies, LLC was formed following the sale of Panavision Imaging to Dynamax Imaging in December 2012. Company Founder and President Mike Joyner: "Each of us literally have decades of experience designing image sensors, and invented patented technology in use today. Let our team of experts create your full custom image sensor, or design your next IC/PCB layout. Town Line Technologies will provide you a solution and personal service that will make your next project a great success." CNES, ASTRIUM, THALES ALENIA SPACE, SODERN invite you to submit an abstract to the 3rd Toulouse CMOS image sensors workshop untitled "CMOS image sensors for high performance applications" to be held in Toulouse, France on November 26th, 27th, 2013 within the framework of the Optics and Optoelectronics Technical Expertise Centre (CCT). The aim of this workshop is to focus on those Custom CMOS image sensors that offer high performance thanks to specific design, technologies/processes or on-chip processing. Although the workshop is mostly oriented to visible/NIR spectral range, this event is fully open to teams working on high performances IR and UV CMOS detectors. Teams developing non-space applications are also invited to propose abstracts, as space applications can also take benefit of innovative concepts from other domains (medical, automotive, machine vision,….). Furthermore, we would like to invite laboratories and research centres which develop Custom CMOS image sensors with advanced smart design on-chip to join this rendezvous. Dagstuhl, Germany Leibniz Center for Informatics published a nice overview of presentations from its seminar "Time-of-Flight Imaging: Algorithms, Sensors and Applications" held on Oct. 21-26, 2012. The seminar has covered a wealth of topics from ToF processing algorithms to sensor and pixel design to brainstorming session on non-standard usage of ToF hardware and ToF vs Kinect comparison. "Photoexcitation cascade and multiple hot-carrier generation in graphene"
Apparently, this is possible due to a very small bandgap in graphene, so that photoelectrons can use their excessive energy to multiply themselves - somewhat similar to X-ray absorption in silicon. Not everything is good about graphene photodetectors. An earlier article in Economist from the same group says that graphene only captures 2.7% of the photons falling on its surface. There are some ways to improve it though. Business Wire: Aptina announces a strategic partnership with LFoundry to continue the manufacture of CMOS image sensors in Avezzano, Italy following LFoundry’s purchase of Micron’s fabrication facility. Micron has been manufacturing imaging sensors for Aptina in the Avezzano facility for over five years. This fab acquisition includes the assignment to LFoundry of Micron’s four-year wafer supply agreement with Aptina. Micron remains a co-owner of Aptina and is committed to supporting a smooth transition of the ownership of the Avezzano facility. "The acquisition of the Avezzano, Italy facility promotes a strategic win for LFoundry, and the Avezzano facility. We look forward to helping Aptina to produce industry leading CMOS imaging solutions," said LFoundry CEO Günther Ernst. "We look forward to our continued relationship with the Avezzano facility, and building on our relationship with LFoundry," said Tony Alvarez, COO at Aptina. 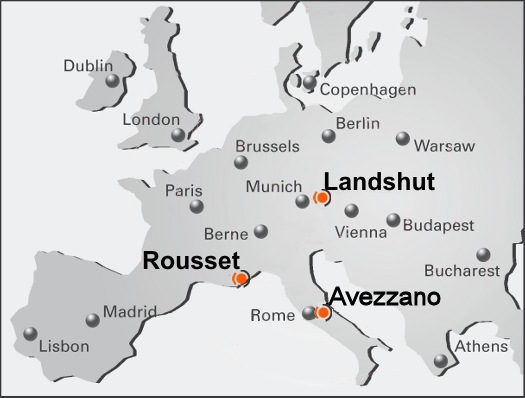 "We have a long and successful history with the Avezzano facility and have shipped to our customers over 1 billion image sensors manufactured at this location. We are confident that LFoundry will build on this legacy to assure the continued reliable supply of high quality and high performance products for our customers." Toshiba: The European New Car Assessment Programme (Euro NCAP) requires automobile companies to introduce autonomous braking systems in 2014. These will initially cover other vehicles, and will be extended to include pedestrians in 2016. Initiatives like this are expected to spur 50-100% growth in the global market for image recognition processors between fiscal 2010 and 2015, from 75 to 100 billion yen. 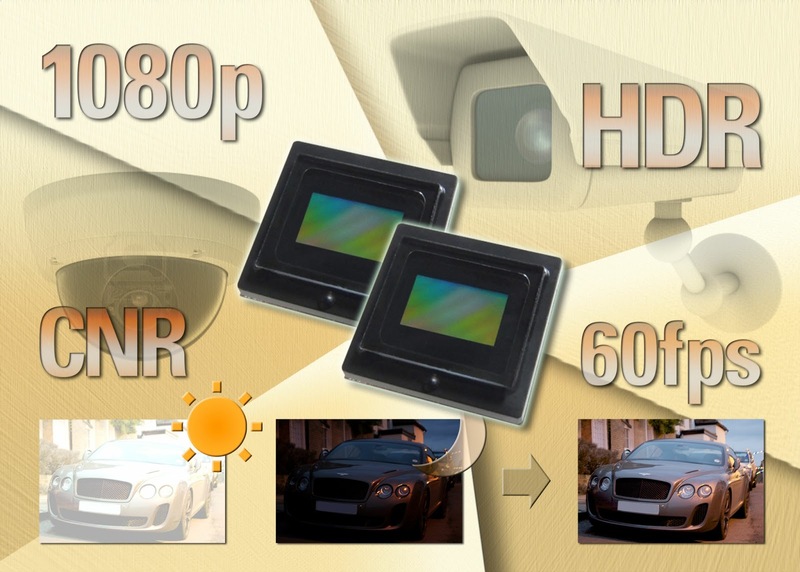 In preparation to this Toshiba announces Visconti 3 series of automotive image recognition processor. The first device in this new series, TMPV7528XBG, is expected to extend its use beyond automotive to industrial applications. 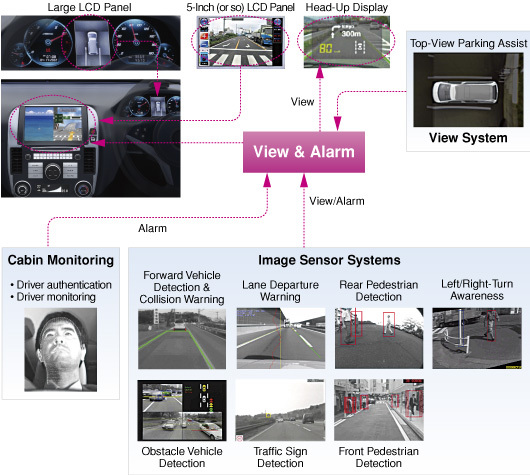 Toshiba initially developed the Visconti series of image recognition processors to advance the creation of camera-based vision systems for automotive applications. The processors recognize traffic lanes, vehicles, pedestrians, traffic signs and more and both the Visconti 2 and 3 series devices incorporate image processing accelerators that detect pedestrians with high level detection ratio in real time. In addition to these capabilities, the Visconti 3 integrates 2-core ARM A9 processor dedicated to supporting applications interfacing with the image recognition processor. With Visconti 3, Toshiba will seek to expand the image recognition processor business beyond automotive systems into camera-based vision systems for industrial applications. The company targets annual sales of 2 million Visconti image recognition processors in fiscal 2015. Sample shipment of Visconti 3 will start in April 2013. Canon announces a high-sensitivity 35 mm full-frame CMOS sensor developed exclusively for video recording. Delivering high-sensitivity, low-noise imaging performance, the new sensor enables the capture of Full HD video in exceptionally low-light environments. The sensor pixel size is 19um, more than 7.5-times the surface area of the pixels on the CMOS sensor incorporated in Canon's top-of-the-line EOS-1D X and other digital SLR cameras. In addition, the sensor's pixels and readout circuitry are said to employ new technologies that reduce noise, which tends to increase as pixel size increases. Thanks to these technologies, the sensor facilitates the shooting of clearly visible video images even in dimly lit environments with as little as 0.03 lux of illumination, or approximately the brightness of a crescent moon—a level of brightness in which it is difficult for the naked eye to perceive objects. When recording video of astral bodies, while an electron-multiplying CCD, which realizes approximately the same level of perception as the naked eye, can capture magnitude-6 stars, Canon's newly developed sensor is capable of recording faint stars with a magnitude of 8.5 and above. Using a prototype camera employing the newly developed sensor, Canon successfully captured a wide range of test video, such as footage recorded in a room illuminated only by the light from burning incense sticks (approximately 0.05–0.01 lux) and video of the Geminid meteor shower. The company is looking to such future applications for the new sensor as astronomical and natural observation, support for medical research, and use in surveillance and security equipment. Nvidia published a whitepeper "Chimera: The NVIDIA Computational Photography Architecture". 7 pages out of 14 are devoted to HDR imaging explanations, others talk about ISP, GPU and CPU hardware. The previously announced features like video stabilization, 3D image reconstruction and image tracking and not covered in the doc. Papers must be submitted by August 31, 2013. Globe Newswire: Micron and LFoundry announce agreement for LFoundry to acquire Micron Technology Italia, Srl. 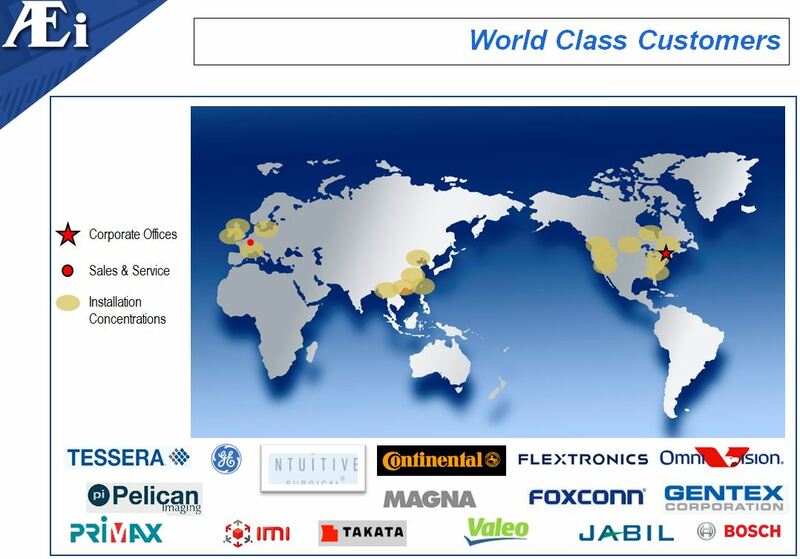 and all of its semiconductor fabrication facility assets in Avezzano, Italy. Under the agreement, Micron will assign to LFoundry its four-year supply agreement with Aptina to manufacture image sensors at the 200mm Avezzano facility. Financial terms of the transaction were not disclosed. 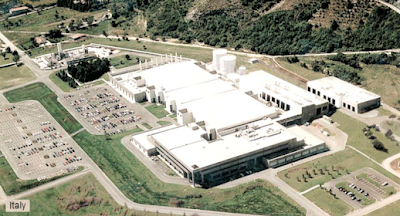 "The transaction not only preserves the facility and jobs in Avezzano, but it also supports a stable and long-term wafer supply for Aptina, further enhancing the value of Micron's equity holdings in Aptina," said Micron CEO Mark Durcan. Sony Cx-News Vol. 71 has few new announcements. The 1/2-inch ICX828 and ICX829 "EXview HAD CCD II" target security cameras market and has a resoltion of NTSC and PAL, respectively. They "provide a significantly improved focusing of light onto the photodiodes due to an increased aperture ratio and an improved upper section structure. Thanks to these improvements, the new products have approximately 6 dB greater sensitivity, a vast improvement over the existing" products. Also, the saturation is said to be improved by a factor of 1.4. The 1/8.3-inch BSI CMOS sensor IMX188PQ delivers 720p60 video and is based on 1.4um pixel.It's aimed to thin laptop computers, smartphones and smart TV markets. Comparing to a previous generation 1.4up pixel product, its power consumption has been reduced by 35%, down to 45mW (720p30 mode) and NNR improved by 4dB, primarily at low-light. CRA is also increased from 25 deg to 30deg. PR Newswire: OmniVision reports quarterly results for for its fiscal quarter that ended on January 31, 2013. Revenues were $423.5M, as compared to $390.1M in the previous quarter, and $185.2M a year ago. GAAP net income was $21.3M, as compared to net income of $10.3M in the previous quarter, and $111,000 a year ago. GAAP gross margin was 16.9%, as compared to 16.6% for the previous quarter, and 24.2% a year ago. The company ended the period with cash, cash equivalents and short-term investments totaling $220.3M, an increase of $80.7M from the previous quarter. The increase was attributable to cash provided by operating activities in the quarter. 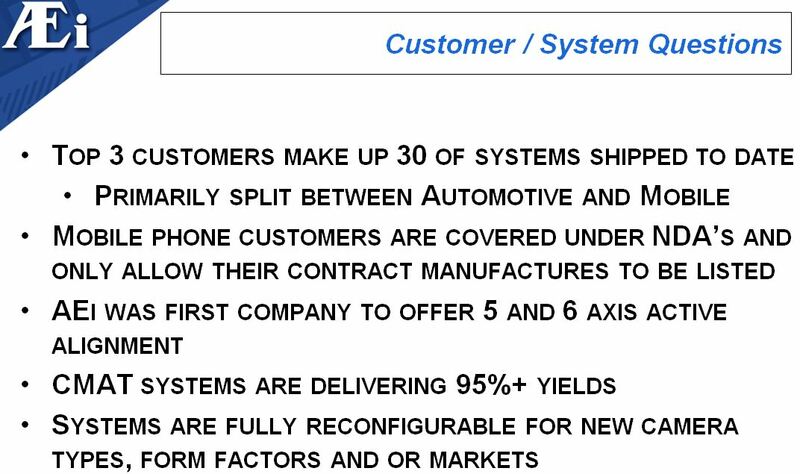 Based on current trends, Omnivision expects revenues for the next quarter will be in the range of $300M to $330M, and GAAP net income be between $0.00 and $8M. Can you confirm that the BSI-2 yields are where you need them to be and if not how long will that take for us to see that? I think we are very comfortable with what we have done to date in terms of coming up with improvements on the production yield ...the yield should not be much of a concern for any one, but I do want to point out is that if in case you want to take this comment to project our next year's performance, likely we will be introducing new SKUs with the producing different parts by then. So essentially, our operation team we have to go through another cycle of yield improvement process.